Finally, we are approaching to the end of this summer (I hope! )… there have been promising 60-degree nights and I am loving it! On the other hand, I can not believe that I have made my favorite bulgur salad, kısır, only once this summer. It normally shows up at our table way more than once. So, before we move onto wearing turtlenecks, I wanted to use whatever bulgur left in my pantry and add this recipe to the blog as well. 1. I have said to some people before (probably when I first came to US and I did not know anything! I mean anything!!) : “This is kısır, you know, like couscous salad” – WAAYY WRONG! Couscous and bulgur are not the same. I am going to quote Wheat Food Council and say: “Couscous is made from durum wheat… Couscous tastes like pasta and is usually seasoned well for serving. It is granular and yellow in color. 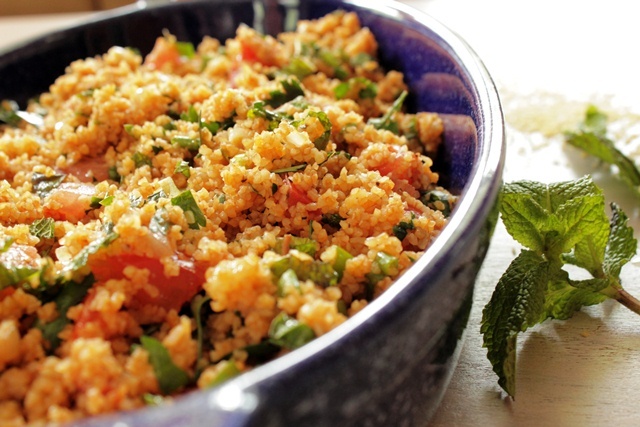 ” Bulgur on the other hand is made of whole wheat kernels. If you want to go into more details, you can visit www.wheatfoods.org. For the record, I have not used this description for a long time now! 2. Then some people might have heard me saying: “This is bulgur salad, made from cracked wheat” – HALF way WRONG.. 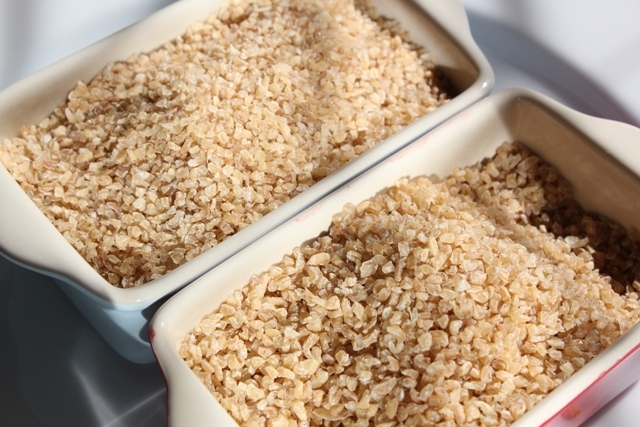 They are similar, made from whole kernel wheat…but their processing is different: bulgur is precooked, but cracked wheat is not! I learn something new every day! 3. The closest description I have given: “This is very much like tabbouleh” – A little bit wrong… Kısır has tomato paste, while tabbouleh does not. Tabbouleh is heavy on parsley and mint, you can barely see the bulgur in it. In kısır, we add parsley for the complimentary taste and the looks. Ok, enough of encyclopedic information. Let’s move onto cooking. One thing I struggled with bulgur is the amount of water it takes. I have found out that different brands and different size of bulgur might require different amount of water. The sizes go from fine to extra coarse. The coarser it gets, the more water it takes.In the picture below, the red dish (to the right) has the coarse kind and the blue dish (to the left) has the medium kind in it. I cook fine bulgur with 1:1 bulgur to water ratio and increase water amount by 1/4 cup for medium to coarse bulgur. It is a nice light salad/side dish and goes pretty much with anything. I used lemon juice for this recipe, but this is one of the dishes that pomegranate molasses can be substituted for lemon juice. Also, some people really like to spice this up and add hot pepper paste instead of tomato paste. I am not the best when it comes to very hot, spicy food, so I used tomato paste (One of my friends at work who is the king of hot spices said to me once “it really does not mean much when you say a dish is spicy”. So I don’t have much credibility in the hot spice world.). I have seen different variations of kısır as well with carrots, dates, raisins. Hope you find your tweak to the recipe and enjoy it. Alternative ingredients: You can use fresh dill, finely diced red cabbage, even finely chopped walnuts in kisir. 1. 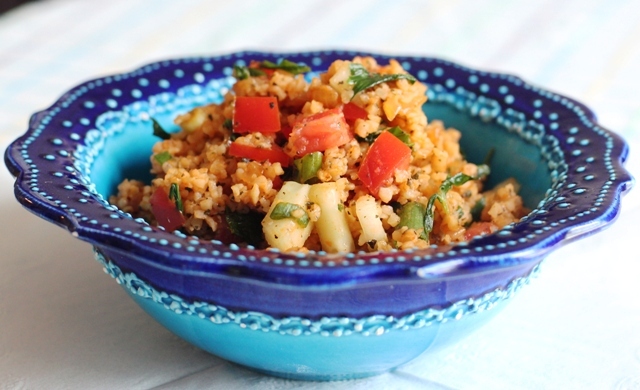 Place bulgur in a bowl. Add salt and pepper. Boil the water and pour it over the bulgur. 2. Cover the bowl with saran wrap and set aside for 20 minutes. 3. Saute yellow onions in 2 tablespoon of olive oil in a pan until they change their color. 4. Add onions to bulgur, cover, wait for another 10 minutes. 5. Add the tomato or red pepper paste to bulgur. Mix well until all paste dispersed in the bulgur. 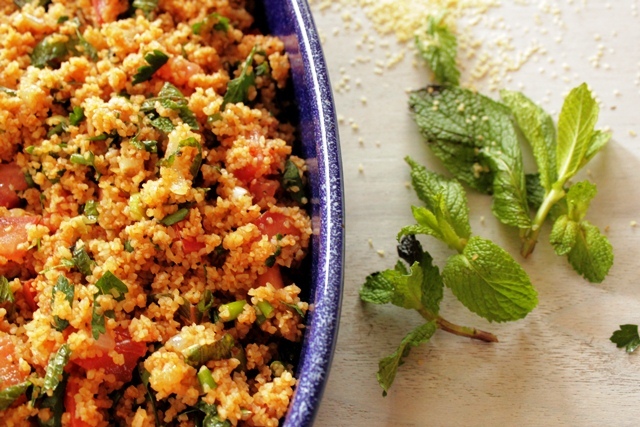 Add green onions, parsley, fresh mint and mix them well with the bulgur. 8. Add tomato and cucumber. 9. Add dry mint and crushed red pepper. Adjust it if necessary for your taste. This salad looks awesome! I grew up on bulgur and just found some and bought it today. Will probably make this tomorrow since I have all the ingredients. Will definitely let you know how it turned out but I am sure it will be yummy! Thanks! Kisir is one of my favorites. I like the fine grain as well, but sometimes I can only find number 2. I was a foreign exchange student in Turkey many, many years ago, and my host mother was from the Adana region and she made the best kisir I’ve ever had. Yours looks like hers! Thanks for posting this. I currently live in Turkey and had the pleasure to taste it! and I loved it. I found your recipe and it tastes so similar to what I had! Thanks! By submitting a comment you grant Ilke's Kitchen a perpetual license to reproduce your words and name/web site in attribution. Inappropriate and irrelevant comments will be removed at an admin’s discretion. Your email is used for verification purposes only, it will never be shared.